DDS point-to-point and multipoint applications. 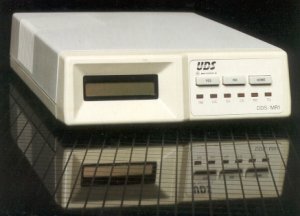 The UDS DDS/MR1 is a multi-rate DSU/CSU. It provides data transfer at rates from 1.2 up to 64 kbps over the DDS network. The model combines the functions of a Data Service Unit with the functions of a Channel Service Unit. Designed for use on the Digital Data Service (DDS) network, the UDS DDS/ MR1 combines the functions of the Data Service Unit (DSU) with the Channel Service Unit (CSU) into a single compact unit. The DDSMR1 complies with the requirements specified in Bell publications 62310 and 41450 and is compatible with the UDS D56 and D19.2. The model provides full duplex, serial communications at 64, 56, 19.2, 9.6, 4.8, 2.4 and 1.2 kbps over 4-wire unloaded twisted-pair cable systems and DDS point-to-point and multipoint applications. The model also functions as a limited distance modem with the distance between units being a function of the data rate and wire size. Installation of the DDS/MR1 is simplified by the integral CSU which provides the necessary equalization and line conditioning. A DB-25 type connector is used to connect the data terminal equipment to the DDS/MR1. If the model is equipped with CCITT V.35 interface circuitry, an optional external adapter module provides a 34 pin V.35 connector.